The World LEADERS Conference gathers the very best speakers from around the world to come together and celebrate servant leadership. 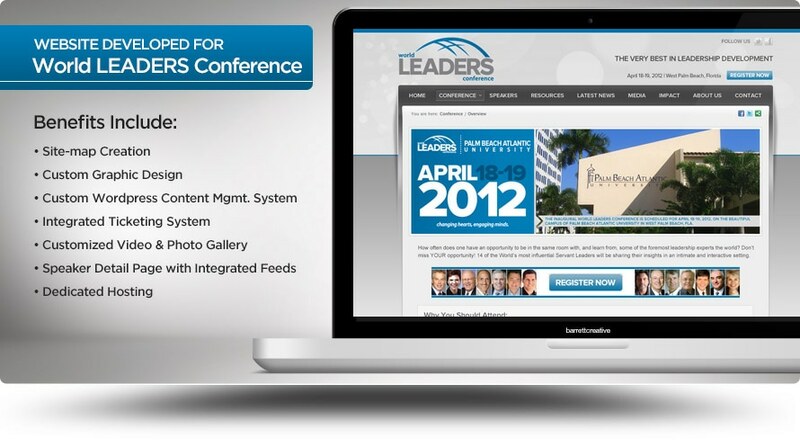 The 2012 conference featured noted speakers Tony Blair, Cokie Roberts, Ken Blanchard, Bill Hybels, Henry Cloud, Patrick Lencioni, Craig Groeschel, Erwin McManus, Jim Blanchard, Mark Floyd, and Tim Sanders. Barrett Creative was challenged with the idea to create a robust website platform for the inaugural conference that could be scalable as additional events were added and the organization grew. From the initial brainstorm session to integrating the seat selection module, Barrett Creative was able to deliver above and beyond what the sold-out conference required.